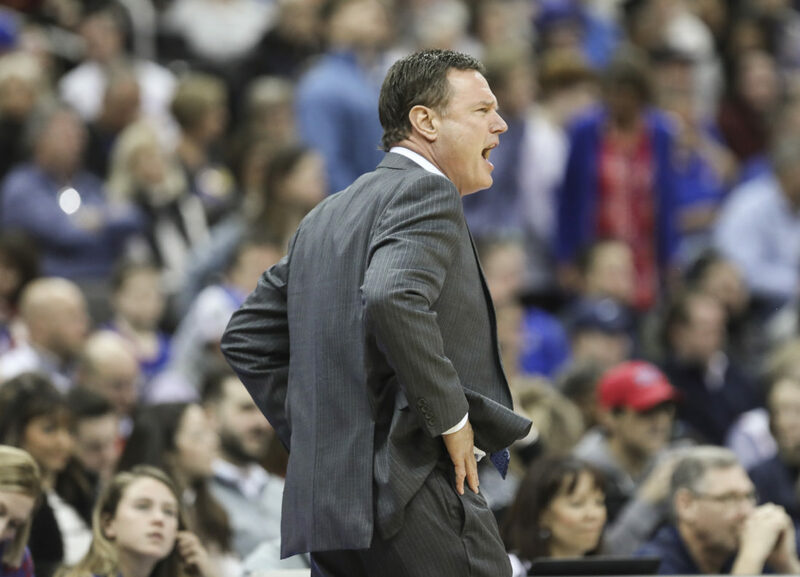 Kansas head coach Bill Self gets the attention of his players during the second half on Saturday, Dec. 8, 2018 at Sprint Center. Kansas City, Mo. 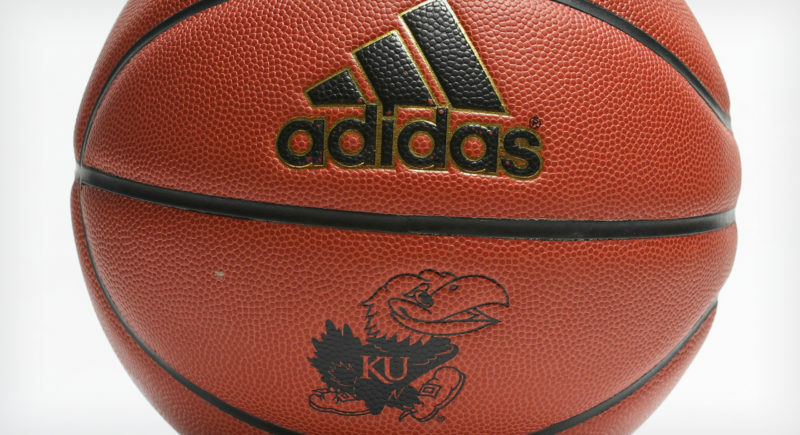 — The gauntlet of good resumes continued Saturday night for the second-ranked Kansas men’s basketball team, which survived a scare from New Mexico State, 63-60, at Sprint Center. The Aggies (7-2) were the sixth KU opponent already this season that ranked in the KenPom Top 100 (at No. 92), with only Vermont (114) and Louisiana (133) sitting outside of double digits in KenPom’s rankings. 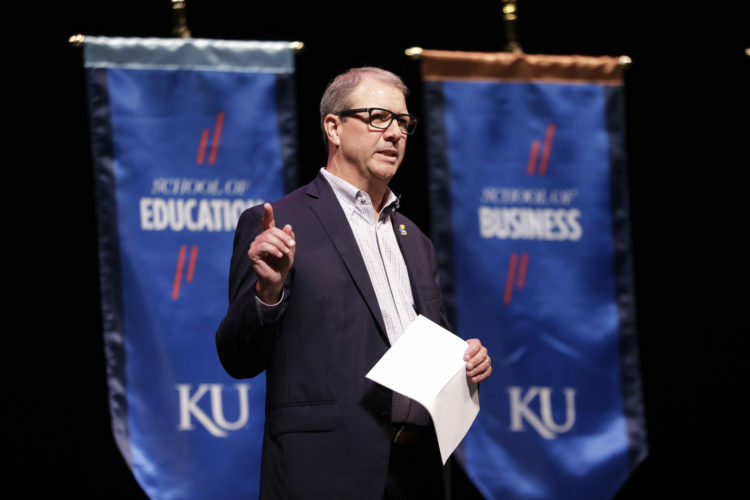 KU coach Bill Self has talked often this season — and plenty in years past, as well — about how the strength of KU’s nonconference schedule, which this year features nothing but teams picked to either win or finish second in their conferences, can build both confidence and KU’s case for a stronger seed come NCAA Tournament time. Top 100 victories typically are considered to be exactly that, and things don’t appear to be changing any time soon. Two of KU’s four remaining nonconference games before the start of Big 12 play are against KenPom No. 18 Villanova (Dec. 15) and at No. 45 Arizona State (Dec. 22). For the second consecutive game, Kansas senior Lagerald Vick was on the bench when the opening went up into the air. Vick finished 2 of 8 from the floor for 5 points, six rebounds and five assists in 31 minutes off the bench. Asked after the loss if the better team had won, New Mexico State big man Johnny McCants stopped just short of confirming the question. But it was clear, based on the tears in his eyes and the words that came before it, that McCants believed the Aggies let one get away. “This game should’ve been ours,” he said at one point early in the postgame media session. NMSU coach Chris Jans seemed pleased with his team’s fight from start to finish. 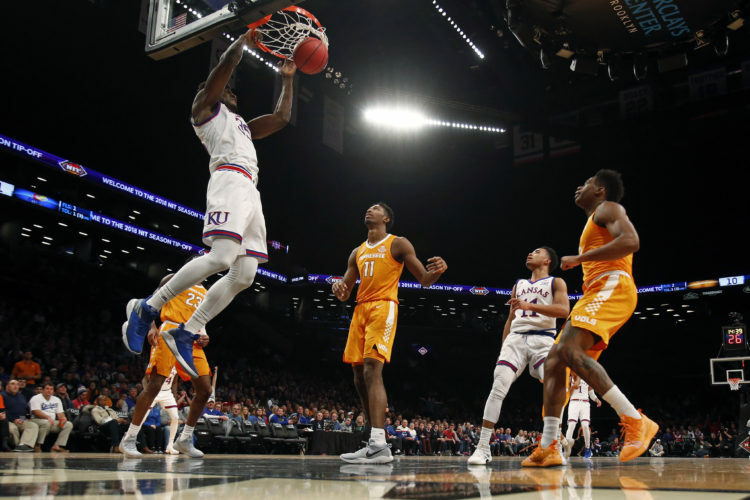 Kansas is now 39-9 all-time inside Sprint Center, with the majority of those wins coming in postseason play, either the Big 12 tournament or NCAA Tournament. 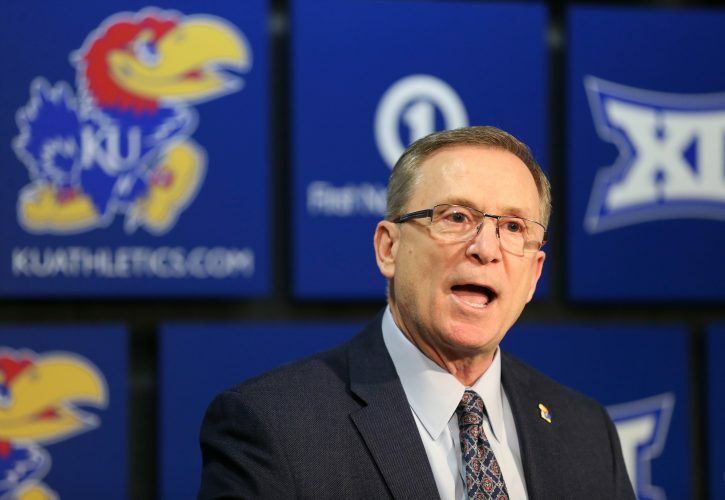 Even though the Jayhawks have not always played their best games at Sprint Center, Self said earlier this week that he likes playing regular season games there for a number of reasons. KU’s history in Kansas City, of course, goes back way beyond the 12-year history of Sprint Center. Kansas has now played at least one regular-season game in Kansas City in 30 of the past 33 seasons. The Jayhawks are 225-83 all-time in their unofficial home away from home, with 81 of those victories coming at Kemper Arena. New Mexico State missed its first opportunity this season to record a program-first win over an Associated Press Top 10 team in back-to-back seasons. Last season, the Aggies defeated then-No. 6 Miami in the semifinals of the 2017 Hawaiian Airlines Diamond Head Classic. The last time New Mexico State defeated an AP Top 15 team in consecutive years came during the 1980-81 and 1981-82 campaigns, when the Aggies took down No. 14 Wichita State before defeating No. 10 Tulsa. The rest of NMSU’s schedule, at least as of today, is missing another Top 10 opponent, so the Aggies may have to make the NCAA Tournament to get another crack at it. The Jayhawks now lead the all-time series with New Mexico State, 4-0 … KU is off to an 8-0 start for the first time since the 2010-11 season … Kansas has now won four consecutive games at Sprint Center and is 3-0 to open the month of December for the 11th time in Self’s 16 seasons.